Since 2013, Scuppernong Books has been serving the literati of Greensboro and the surrounding areas with a well-curated bookstore that hosts tons of events each week for readers, writers, and the greater citizenry. Scuppernong Books was also the driving force behind this year’s inaugural Greensboro Bound Literary Festival that welcomed big-time names like Nikki Giovanni, Carmen Maria Machado, and Lee Smith. It also serves as an excellent local watering hole. 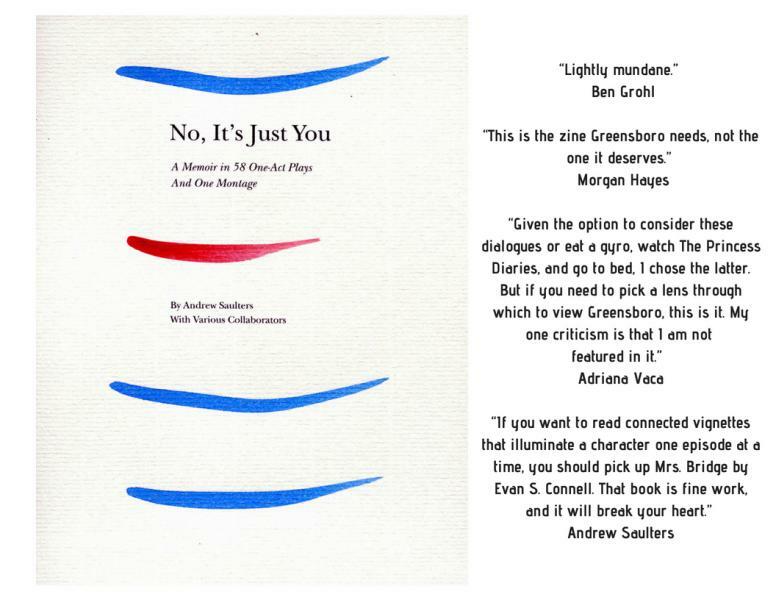 Their first title is No, It’s Just You by Andrew Saulters, a collection of 58 one-act plays and one montage. The launch party happens Tuesday, September 4, at 7:00 pm at Scuppernong Books in downtown Greensboro. Described as “lightly mundane” by Ben Grohl, all the the blurbs for this title are, in fact, hilarious, and definitely worth checking out here. Scuppernong Editions is not accepting submissions at this time. But it’s a fair bet that if you hang out at the launch party, you might learn a lot more about what else is in the works! This was written by charles. Posted on Tuesday, August 21, 2018, at 10:13 am. Filed under Uncategorized. Tagged Andrew Saulters, Ben Grohl, Carmen Maria Machado, greensboro bound, lee smith, Nikki Giovanni, scuppernong books, scuppernong editions. Bookmark the permalink. Follow comments here with the RSS feed. Both comments and trackbacks are currently closed.